An old man makes a long journey by tractor to mend his relationship with an ill brother. 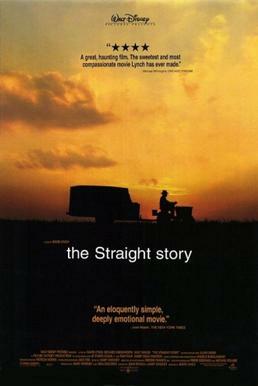 ‘The Straight Story’ is named after it’s protagonist, Alvin Straight, but it also works on a simpler level as this is David Lynch’s most straightforward film to date. The film is based on the true story of Alvin Straight, a 73 year old man who travelled 400 miles across state lines to visit his brother on the only means of transport available to him. The quirk is that this mode of transport happens to be a lawnmower. In essence, ‘The Straight Story’ is a road movie as it follows Alvins travels across the country and captures the encounters he as along the way, but at its heart, the film is a story about old age, family and regrets, and it’s quite beautiful. Alvin is played by Richard Farnsworth, who was terminally ill at the time of shooting and tragically took his own life the year after the film’s release. He took the role because he was inspired by Alvin Straight’s story, and his raw and understated performance led to an Oscar nomination (at the time he was the oldest person to receive an acting nod). His performance is remarkable and a lot of its strength is conveyed silently – picture one great scene where Alvin sits round a fire and has a conversation with a young female hitchhiker. Farnsworth’s eyes are so emotive, and Lynch’s measured and lingering camerawork allow time to focus on his face as he metes out some fatherly advice to a girl at a literal and metaphorical crossroads in her life. Alvin is a man who has lived his life and feels a responsibility to make things right with his brother, and the contrast between the mistakes and regrets he feels and those of the young girl really registered with me. This is just one of many moving encounters on Alvin’s journey and the film truly thrives in these small character moments. Another memorable scene focuses on a conversation Alvin has with a man of similar age in a bar, where they discuss the past and wartime experiences. David Lynch is a director known for surrealism and style and it’s great to see him changing tack to direct a personal story such as this, where his direction is very low key and allows space for his actors to perform. If you compared this to a concert, ‘The Straight Story‘ is David Lynch performing a stripped back set, and this applies to all other key contributors (including regular composer Angelo Badalamenti, who does some excellent work here as we’ve come to expect). The locations throughout are gorgeously shot, with the scenery accompanying Alvin’s travels a wonderful showcase for the beauty of the countryside in the American Midwest. The end of the journey delivers a terrific conclusion to the film, perfectly written and incredibly moving, and it reinforces the themes discussed throughout. ‘The Straight Story’ is an excellent movie, charming and understated in its tale of Alvin, a quiet, kind man who hears that his brother has had a heart attack and feels compelled to see him again after a long time. Very much a character piece, Richard Farnsworth is wonderful in the lead role, and in tandem with Lynch, they craft a moving ode to love, loss and family, and this is a movie well worth seeking out, even for those turned off by Lynch’s other works. ‘Mulholland Drive’ is the penultimate film in my David Lynch retrospective, and after the first time I watched it I said “I think I’ve watched one of the best films I’ve ever seen”. We’ll see how my opinion holds up after a second viewing over the next week!